First, an individual or company decides a certain piece of ground has mineral potential. This is done by researching geological reports, historical work and findings, and/or interesting rock found on the ground. At this point, the ground must be claim staked. This gives the owner(s) the mineral rights for a period of 2 years. The 2 years can be extended if the stake holders do a required amount of work in dollars spent. Photo: Karl (Dad) falling a tree to finish the claim post. Claim staking is done by marking out the perimeter of a rectangular shaped piece of ground. Think of it as a loose method of surveying. Lines must be north-south and east-west. 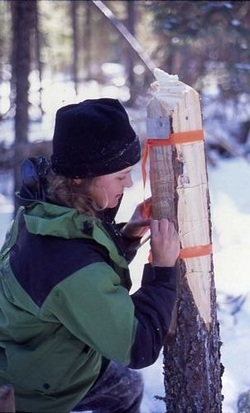 Lines are made by blazing both sides of trees with an axe, clearing underbrush, and hanging flagging tape. Every corner and every 400 metres, a post at least 4 feet high and 4 inches square must be made and tagged. Tags are purchased from the Ministry of Northern Development and Mines (MNDM). Corner posts must tell the time, date, staker’s name, and staker’s licence number. Every claim must have a start and finish time. This is in the event of a dispute if two parties claim the same ground. Once finished staking the claims, they are drawn up using a sketch and recorded at the MNDM office. Photo: Katarina writing the legal information on a corner claim post. To view current status of claims in Ontario, click the following link, answer yes to disclaimer and zoom in on specific area. Topographic Claim Maps in Ontario.